For once, I remembered to thaw something out from the freezer, so it was tuna this evening! 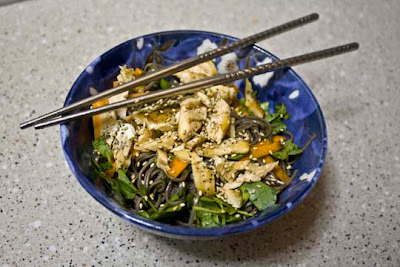 The star of the show tonight is sesame--whether sesame seeds or sesame oil. Sesame oil isn't all that hard to find; you can generally pick it up at any well-stocked supermarket in the Asian section, but be sure to refrigerate it after opening because sesame oil can go rancid a little faster than other oils. Miso soup again? Yes, but this is a more "classic" form of miso soup made with wakame seaweed. I didn't have any tofu, however, so I modified it by using udon noodles. Note: Yasai fumi fuikake is a type of rice seasoning that contains sesame seeds, dried carrots, spinach, pumpkin, celery, Japanese mustard plant and other seasonings. It's just one of many flavors of rice seasonings that come in shaker bottles. You can get them in the Asian section of supermarkets, but I think I've only seen them in more specialty places. You can use any flavor of rice seasoning for this recipe, but if you can't find it, you can certainly just use more plain sesame seeds. Put the mushroom in a small bowl and pour boiling water over it. Let stand to reconstitute. After the mushroom softens, squeeze out the excess liquid and cut into slices. Put the wakame in a separate bowl and pour cold water over it. Let stand to reconstitute. After the wakame softens and expands, drain the liquid and rinse the seaweed thoroughly. Set aside. Cut the tuna into cubes 1 in. thick. Roll the fish pieces in the sesame oil, and then in the sesame seeds. Using a pair of kitchen scissors, cut the nori sheet into 1 in. strips. Wrap a strip around each tuna piece, trimming off the excess nori so that it goes around the fish once with only a little overlap. Boil water in a pot, then add the spinach. Cook 1-2 min. to blanch, then drain, rinse with cold water, and drain again. Roll the spinach into a ball and squeeze as much liquid out as you possibly can. Set aside. Boil water in a pot, then add the udon noodles. Cook according to package directions, then drain, rinse with cold water, and drain again. Heat a frying pan over medium heat and add the fish pieces, exposed end down. Do not add any extra oil. Cook the fish on one side until well browned, then flip over to the other exposed end and cook until browned. The tuna pieces will still be a little raw in the middle, but if you'd like your fish fully cooked, just cook each end a little longer. Remove from heat after the fish you're done cooking. Boil the measured water in a pot, then add the dashi granules and soy sauce. Stir until the granules are completely dissolved. Add the wakame and mushroom and cook for 1-2 minutes. Add the noodles and cook until heated. Finally, add the miso paste and turn off the heat. Stir to dissolve the miso. Sprinkle with extra sesame seeds. To serve, spoon the soup into a serving bowl. Put the tuna on a small plate, and the spinach next to the fish. Make an indentation in the top of the spinach ball and fill with rice seasoning. Serve with soy sauce. If you look for this recipe in a sushi book, you probably won't find it. I created it myself! I got inspired by plain umeboshi (pickled plum) sushi, and decided to add takuan (pickled diakon raddish) and cucumber. It's a mix of sweet and salty in each bite. I know what you're thinking: But sushi chefs train for years! I can't do this!! Yes you can. It's actually not that hard. It might not look quite as pretty as when a real sushi chef does it, but it tastes fine and it's much cheaper than going out. The only special 'equipment' you need is a sushi rolling mat. You can often find them in well-stocked grocery stores nowadays. Try it out yourself and let me know what you think! Rinse the rice in cold water several times until the water runs clear. Put the rice in a pot with a tight-fitting lid with the measured water. Bring to a boil and continue to boil until all the liquid is absorbed. Remove from heat, but leave the lid on for another 10 min. Afterwards, add the vinegar and incorporate using a slicing method with a spatula (don't stir!!). Dump the rice out onto a plate and spread evenly. Cool the rice to room temperature. Note: Sushi is one of those times where you HAVE to cook fresh rice. Frozen or left-over rice will not work. Chop the umeboshi well, creating almost a paste. Julienne both the cucumber and takuan into 1/4 in. strips. Set aside. 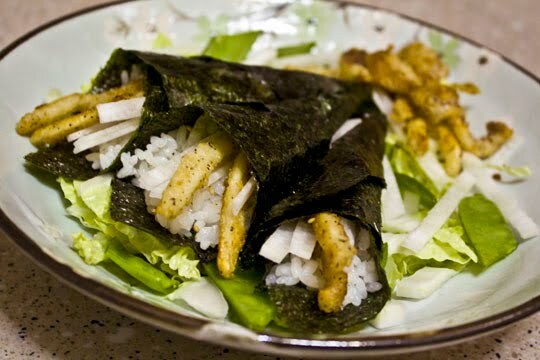 Tear the sheet of nori in half. Lay one half of the sheet, smooth side down, on the edge of a sushi mat nearest to you, with the long edge closest to you. Wet your hands, and spread 1/3 of the rice over the nori, leaving a clean strip of about 1/2 in. at the top and bottom. Spread 1/2 of the umeboshi paste in a line across the middle of the rice. Place on top a line of takuan and another line of cucumber. Lift the edge of the mat closest to you with your thumbs, using your fingertips to hold in the filling. 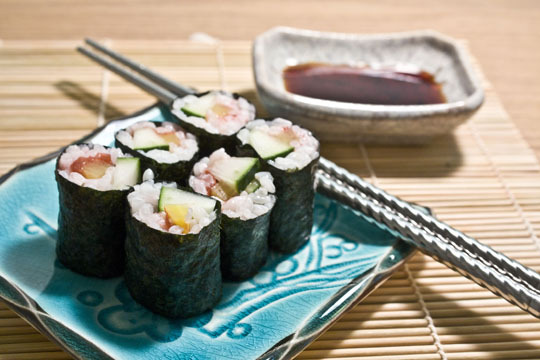 Roll the nori and fillings into a log, lifting the mat away as you go. You may need to dab a little bit of water on the exposed edge of the nori (the part you didn't put rice on) to help it stick. After the roll is made, apply firm, even pressure with your hands on the bamboo mat to help hold everything together. Unroll the sushi from the mat and transfer to a cutting board. Wet the blade of a very sharp knife and cut the roll in half. Cut each half into thirds, wetting your knife each time. Serve with soy sauce, wasabi, and pickled ginger, if desired. Note: You'll have some left-over rice. If you want to use it all, just chop up some more takuan, umeboshi, cucumber, and nori. It'll make one more roll. 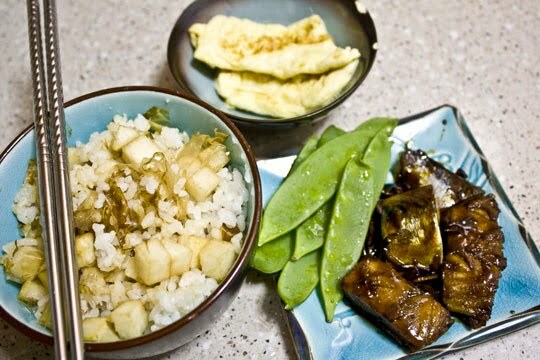 If not, you can use the rice just to eat or use in ochizuke. 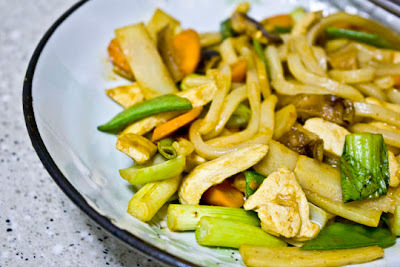 This recipe is one of my own concoctions, inspired by a udon bowl I had at a little Japanese steakhouse at the Waterfront in Pittsburgh, PA. The udon I ate there had shrimp tempura in it, but it also had kamaboko fishcake in it. This is a hearty noodle bowl with many delicious flavors, and it is very quick and easy to prepare. Note: Kamaboko is a Japanese fish cake. It's usually a semi-circular shaped log, with a white center and a pinkish "rind." It has a little bit of an odd texture to the uninitiated, but it has a nice subtle fish flavor. Put the mushrooms in a small bowl and the noodles in a pot. Cover each with boiling water to reconstitute. After the noodles have softened and the mushrooms re-hydrated, drain the noodles and rinse them with cold water. Squeeze the excess liquid from the mushrooms and cut them into strips. Put the pork belly pieces in a dry pot and saute until the meat is cooked. Add the chicken stock, soy sauce, and rice wine, and bring to a boil. 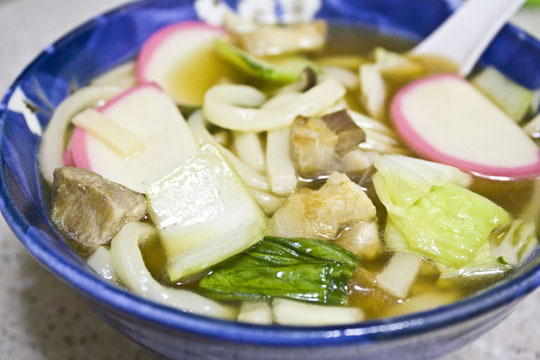 Chop the bok choy and cabbage into bite sized pieces, then add to the soup along with the kamaboko slices and mushrooms. Simmer for 1-2 minutes, then serve. I didn't use a recipe tonight, so I just made this whole meal up in my head. 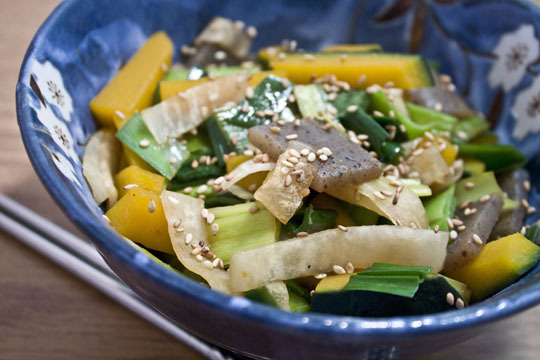 It sounded really good when I thought about it: konnyaku, kabocha, leeks, and diakon stir fried up with a soy & sesame dressing! It even looks kind of pretty. Not my best tasting dish. (Hey, I'm allowed to have off-days, right?) It's not disgusting, it's just not as flavorful as I would have liked. But then again I'm one of those weird people who has almost zero sense of smell, which causes my sense of taste to be more subdued, which is why I heavily season my food. Don't just take my word for it, though, give it a try and let me know what you think! 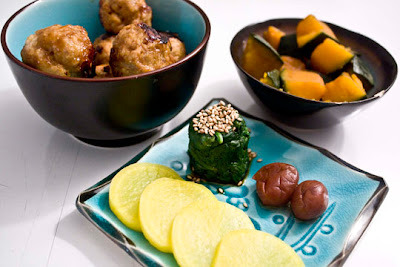 The kabocha can take a while to cook, so chop it up into 1/4 square sticks and put them in boiling water for 6 - 8 min. or until they are soft to a fork sticking in them. Chop the leek into 1/2 in. slices and add them to the boiling kabocha for the last minute or so of cooking to blanch. Drain. Slice the konnyaku into 1/8 in. thick slices, and shred the diakon. Heat a little vegetable oil in a pan, then add the konnyaku and cook until ever so slightly browned. Add the diakon and cook until soft. Mix together the soy sauce, sake, dashi granules, and sesame oil until the dashi granules are fully dissolved. Add the drained leek and kabocha to the konnyaku and diakon and cook until heated through. Add the sauce, then immediately turn off the heat. Stir until the sauce is fully incorporated. Sprinkle with sesame seeds and serve immediately. Have leftover rice? Have no idea what to do with it? Leftover rice, to be really honest, doesn't taste all that great, depending on what kind of rice it is. The best thing to do with leftover rice is to make fried rice. Now, I know yinz have all seen fried rice at Chinese places. Sound difficult? Actually, it isn't! This particular recipe is straight from Cooking from Above: Asian by Jody Vassallo (other than the fact that I'm putting the directions in my own words) because I had all the ingredients for once and I didn't feel like making anything up. Note: Fried rice is really only done with left over/cold rice. If you don't have any already made, make rice as normal, then put in the fridge until it has thoroughly cooled before making this dish. If you've made frozen rice packets (see "No Rice Cooker? No Problem! "), it will make your life that much easier! Just thaw out one of the rice packets and you're good to go. Roughly chop the shrimp into pieces and slice the lup cheong into 1/4 in. pieces on the diagonal. Heat half of the oil in a pan, add the egg, and swirl in the pan to coat the bottom. Cook the egg until set, then remove from the pan and roll up into an omelet. (Or, if you're like me and you are incapable of cooking a proper omelet and butcher it to pieces, just make a blob of egg roughly shaped like a log. It'll still taste the same.) Cut the egg into thin shreds. Add the rest of the oil to the pan, then add the shrimp, ginger, and lup cheong. Stir-fry until the shrimp turns pink/red. Slice the scallion into roughly 1/4 - 1/2 in. pieces on the diagonal, then add them, the rice, and the egg to the stir fry to heat through. Mix the rice wine and soy sauce together, then add to the pan, cook, and stir briefly until the stir fry is evenly coated. Serve immediately. The original recipe for tonight's dish came from Cooking from Above: Asian by Jody Vassallo, although I modified it, of course. This is something really quick and easy when you're in a rush, and it's a quick clean-up, too, especially if you don't have a whole lot of time to be doing dishes. Note: You can certainly buy fresh udon noodles in the refrigerated section of some Asian stores, but I've found it easier and cheaper to pick up packages of frozen udon noodle bundles. They're pretty big, so using 1/2 block should be plenty for one serving, especially with all the rest of the veggies and meat being added. However, be sure to use fresh udon--the dried stuff really won't have the same texture, even after it's cooked. Put the shitake mushrooms in a small bowl, and the frozen udon in another larger bowl. Cover both with boiling water and leave to soak until the shitake reconstitute and the noodles thaw and soften. Drain the noodles and rinse them in cold water after they have softened. Heat the oil in a large skillet. Cut the chicken breast into 1/2 in. strips, then add to the pan and cook until browned. Squeeze the excess water from the mushrooms and cut into 3/8 in. strips. Slice the carrot into 1/8 in. slices on the diagonal. Add the mushrooms and carrot to the pan and cook 2 - 3 min. Cut the spring onion into 1 in. lengths, the bok choy into bit sized pieces, and the snow peas in half on the diagonal. Add the vegetables and the noodles to the skillet and cook for another 1/2 min. Mix together the sake, soy sauce, red pepper flakes, and chili sauce. Add to the skillet and stir. Continue to cook and stir until the sauce has heated and coated everything evenly. Serve immediately. A new episode of my favorite TV show was coming on, so I whipped up the quickest thing possible. I bought some leeks yesterday and I've been having a craving for miso, so I tossed together a leek miso soup, also using up the rest of my glazed pork balls from yesterday that I didn't finish. This was actually the first time I've ever cooked leeks, and I must say they're pretty good! I didn't use a pre-made recipe tonight and I don't usually measure my ingredients when I cook, so I'm just shootin' with the measurements below. Enjoy! Note: dashi granules are dried instant granules of dashi stock, a Japanese soup base made from bonito flakes and kombu seaweed. The granules are often marketed under the name Hon-Dashi, and they're very convenient. Miso paste is a Japanese fermented soybean paste, and comes in several types, usually red and white. Red miso is more traditional and has a stronger flavor than white miso. Put the mushrooms in a small bowl and pour boiling water over them, and leave them to soak for a few minutes to reconstitute. In the meantime, boil the measured water and add the dashi granules, soy sauce, and rice wine. Shred the leek into 1/4 in. strips, then add to the stock. Simmer the leek for 3 - 4 minutes until tender. Squeeze the excess moisture out of the mushrooms, and cut them into 3/8 in. strips. Add the mushrooms and pork balls if using to the stock and simmer for another 1 - 2 min. until the pork balls are heated through. Add the miso paste and turn the heat off. 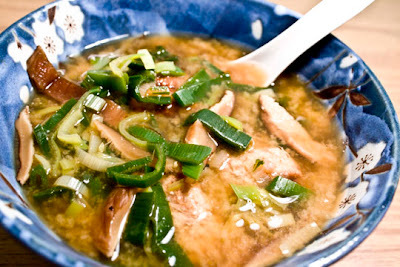 Stir the soup until the miso has completely dissolved. To serve, spoon the pork balls into a serving bowl first, then add the rest of the soup over top. I went out and got some ground pork and half a kabocha (Japanese squash) today, so I set about putting them together in one meal. I've never cooked kabocha before, so it was a new thing to me. It's wonderful, and I recommend it to anyone who hasn't tried it before! No cookbook recipes tonight. While I got ideas and relative measurements from some of the recipes in my books, I generally made up what I cooked tonight, so we could say these are my own recipes. Combine the ingredients for the pork balls and mix together well with your hands. Roll the meat mixture into meatballs roughly the size of a golf ball, and set aside. In a pot, boil water, then gently drop in the meatballs. Cook the meatballs for 6-7 minutes until they change from pinkish to creamish and float to the top of the water. Drain. Heat up a grill and add the meatballs (I found that a George Foreman grill works just fine). Cook until somewhat browned. Mix together the ingredients for the glaze, and cook them until the sauce starts to thicken. Remove from heat and pour into a separate cup. When the meatballs have browned, brush the glaze all over the meatballs and continue to cook until the glaze caramelizes on the meatballs. Remove from the grill and set aside. In a pot, boil water and blanch the spinach leaves for 1 minute, then drain well. Squeeze as much moisture out of the leaves as possible and form into a little cylinder. Pour 1/2 tsp. soy sauce over the spinach and sprinkle with sesame seeds. Cut the kabocha into roughly 1 in. chunks, but leave the green skin on. Boil water in a pot and add the kabocha, cooking until tender. The kabocha is done when a fork easily pierces the flesh. Drain. Heat the soy sauce and sugar gently in the pot and add the kabocha. Stir until well coated, then remove from heat. 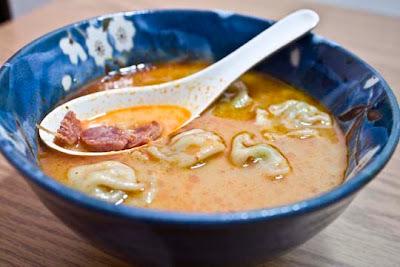 While the vast majority of the recipes I've shared with you so far have been from various cookbooks that I've modified in one way or another, this one I've made up myself, with the exception that I used the same soup base as the Spicy Prawn and Lup Cheong soup from before. I love tom yum paste! (I've even been known to eat a spoonful of it straight from the jar.) I got such a craving for it today that I felt compelled to make a spicy soup tonight. I also couldn't decide whether I wanted fish or meat, so I added both. The tom yum soup base is absolutely delicious, and it's easy to make it your own flavor by adding anything you want like I did here. Boil water in a pot and add the rice noodles. Cook 6 - 8 min. until white and tender, then remove from the pot and drain. Add the tom yum paste to the pot and heat until fragrant, then add the water, coconut milk, and chili. Bring to a boil and simmer for 1 min. Cut the mackerel fillet into roughly 1 in. square chunks, and slice the lup cheong on the diagonal about 1/4 in. thick. Add the fish and sausage to the soup base and continue to simmer until the fish is cooked. Cut the spring onions into 1 in. lengths, and slice the bok choy leaves into bite-sized pieces. Add the vegetables to the soup and simmer for another 2 or so min. Add the cooked rice noodles and continue to cook just until the noodles are reheated. To serve, spoon the noodles into a serving bowl first, then spoon the rest of the soup over top. Last night I was swamped again, so I didn't get to post my recipe until this morning. I did, however, get enough time to try out another bento recipe from Bento Boxes by Naomi Kijima! I had some frozen, salted mackerel that would thaw easily enough and some frozen rice packets, so this was something quick enough to whip up late at night. First, either cook your rice (use about 1/3 c. uncooked rice if you don't have any already made) or thaw out a frozen rice package (see yesterday's post). 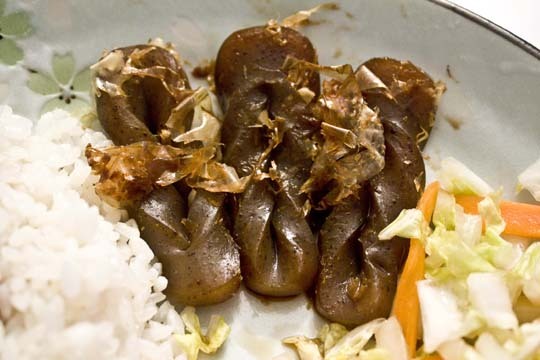 Cut up the diakon into 1 cm cubes and marinate in the soy sauce for 10 min. Drain. Stir the seasoned diakon and bonito flakes into the rice. Cut the mackerel at an angle into 1 in. strips. Julienne the ginger. Bring the sauce ingredients to a boil, then add the mackerel and ginger shreds and cook for 4-5 minutes until the fish is well glazed. 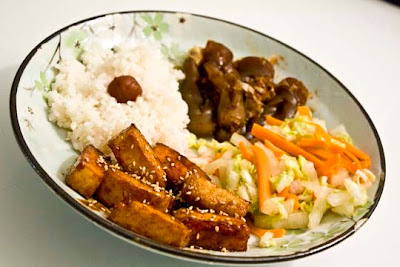 To serve, pack each of the items into a bento box, or put in separate small bowls or plates. Serve with blanched snow peas. This might come as a shocker since I make so much Asian food, but I don't own a rice cooker. *gasp! * (student + no job + outrageous tuition = no munnies) And I know how much of a pain it can be to be making rice in a pot all the time, especially when you don't need that much. Want to know why my recipes usually include 1/3 c. rice even though I don't eat that much? Because I've found out that if you try to make any less than 1/3 c. rice in a pot, it doesn't cook right and has a funky texture. I don't always have the time or patience for that. I finally got around to trying out some of my new recipes from the cookbooks I purchased over the weekend, so I thought I'd share them with the rest of yinz. I tried out Bento Boxes by Naomi Kijima, and so far I really like it! While Naomi gives recipes in suggested whole bentos, I didn't have all of the ingredients for a specific bento, so I did a mix 'n' match, and tried some new things. I never had konnyaku before, but I bought a cake of it on a whim one day, and I tried it out for the first time. It's a little funky to me as far as texture goes, although it seems to pick up on whatever flavors you put with it. Rinse the rice in cold water until the liquid runs clear. Bring the rice and measured water to a boil in a pot with a tight-fitting lid, and continue to boil until all the water is absorbed, but not too dry. Remove from heat, but leave the lid on the pot for at least 10 minutes. Slice the konnyaku cake into 1/4 inch slices, then cut a slit down the middle and pull one end through the slit for a twist shape. Parboil and drain. Cook the konnyaku in the mirin, sugar, sake, soy sauce, and water until all the liquid is absorbed, about 4-5 minutes. Stir in the bonito flakes and set aside. This is what the twisted konnyaku should look like. Cut the fish cake pieces in half, and saute in oil until the pieces are slightly browned. Add the soy sauce, sugar, mirin, sake, and water, and cook for 3-4 minutes, stirring occasionally, until well glazed. Sprinkle with sesame seeds. Julienne the gren cabbage leaves and the white stalks separately. Sprinkle the stem strips and the carrots with the salt, and massage gently. Add the green strips and squeeze out the excess liquid. To serve, place each component on a plate or pack into a bento box, place the umeboshi into the middle of the rice. OK, you know what? I do get really swamped sometimes, so I'm allowed to be lazy here and there. I had some left over rice, so I boiled some water and punched out some chazuke. 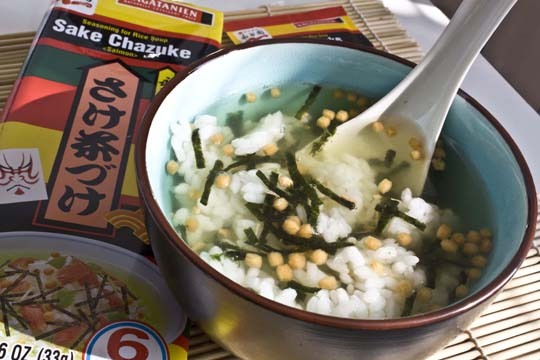 What's chazuke? Well, it's delicious and easy so you should try it! Real chazuke is a rice soup, often containing seasonings such as rice crackers, nori seaweed strips, and maybe some fish or pickles. The "broth" is actually green tea. Yeah, I know it sounds kind of funky, but trust me, it's really good. I've never tried to make my own from scratch, but I probably will at one point or another, but instead I keep some instant chazuke packets hanging around in my stash, which all ready have things like freeze-dried sake (Japanese for salmon - yeah, I got confused the first time, too), the seaweed and crackers, and even instant green tea granules already mixed in. All you do is put left-over rice in a bowl, pour the seasoning packet over top, and add some boiling water! And if you have an electric tea kettle that shuts off automatically when the water boils, it's the easiest thing to toss together when you don't have time to bother with a pot and pan. Where do I get my chazuke packets? While I believe you can get them at really any Asian convenience store or such, I pick mine up at M2M 55 3rd Avenue in Manhattan. They generally come 6 packets to a package for $2.99. 50 cents for a quick lunch? Not bad in my book! For those New Yorkers, I went to Strand Books for the first time today, and absolutely had the time of my life! (And spent way too much money, although my total savings over the list price was about $33. SCORE!) And you know what that means? NEW COOKBOOKS!!! I'm so excited, and when I've tried out a few new recipes, I'll be sure to share them with the rest of yinz! If you're curious, I purchased Japanese Meals on the Go: Bento Boxes by Naomi Kijima and The Asian Kitchen by Lilian Wu. While I'd love to sit down and spend the next three hours looking to see what to cook for dinner, I do have to work on homework... blah. Once again, I forgot to thaw meat out, so I fell back on easy-to-thaw shrimp. 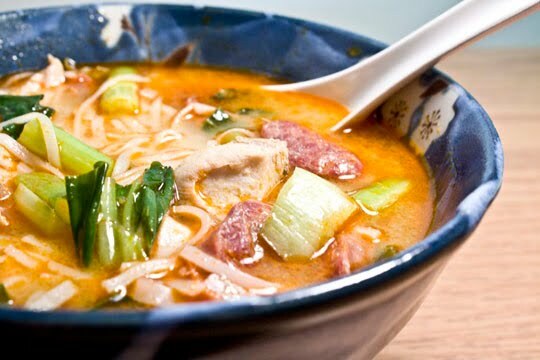 The original recipe for this soup is from the cookbook Delicious Noodles from Confident Cooking (I can't find the author? ), but you should know me by now that I can't leave a recipe alone! I modified it by leaving a couple things out and adding a few other things, including the lup cheong. Note: Tom Yum paste is a wonderful soup flavor base. It is made up of garlic, chili, galangal, kaffir lime leaves, lemon grass, and shrimp paste. It is delightfully hot and sour without be obnoxious. Chop up the shrimp until almost minced, and mix with the spring onion and celery salt. Divide up the filling between the wonton wrappers. Using your finger tip, draw a ring of water around edges of the wonton wrappers. Then fold up the edges of the wrappers and pinch them together into pouches to complete the wontons. To serve, first scoop out the wontons and put them in a bowl, then spoon the lup cheong and soup over top. Up until now, I've been putting up my posts in the morning, but I've decided to switch and put them up in the evening, because I have more time to do it then. So yinz'll just have to wait until tonight! I posted up a new recipe last night, though, so go check out the Teriyaki Chicken! I thawed some chicken legs overnight, so I decided to make teriyaki chicken tonight. The original recipe I used is from one of my other cookbooks, Cooking from Above: Asian by Jody Vassallo, which provides photographs of all the ingredients and each step of the cooking process for each recipe--I highly recommend it! The original recipe is for 4 servings, but since I only had two chicken legs, I cut it down to one serving. If you would like to double or quadruple the recipe, simply double/quadruple the ingredients below and cook the same way. 2 chicken drumsticks (or use thighs, skin on is prefered - if you don't want to eat the skin, remove it after cooking. Place the mushrooms in a bowl and pour boiling water over them. Leave them to sit until they have reconstituted, then squeeze out the excess water and cut into strips. Rinse the rice in cold water several times until the water runs clear, then put in a pot with a tight-fitting lid along with measured water. When the rice comes to a boil, continue to boil until the rice absorbs all the liquid, but doesn't become too dry. Remove from heat, but leave lid on for at least 10 min. 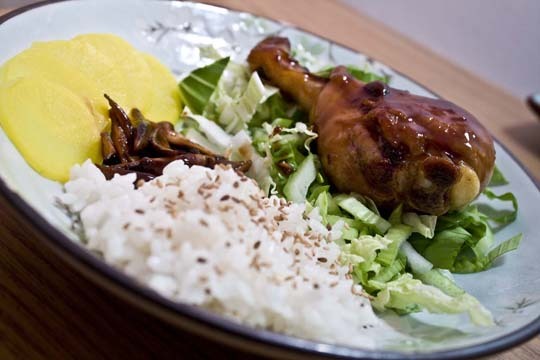 Mix together ingredients for teriyaki sauce, or measure pre-made sauce. Take chicken legs and cut three slits in each one, but not all the way through (this will help them cook more evenly). Heat oil in a pan, then add the chicken, skin side down first. Cook the chicken 10 min. (turning maybe once as needed) until the outside is browned. Place a lid on the pan and cook for 10 more minutes. Remove the chicken from the pan. Add the teriyaki sauce to the pan and boil until the sauce becomes glossy. Return the chicken to the pan and continue to cook the chicken until the sauce has caramelized on the chicken and thickens a bit. Be careful! The sauce will burn quickly after too much moisture has evaporated! After the chicken is fully cooked and thoroughly coated in the sauce, remove from pan and turn off the heat. Toss the mushrooms in the sauce left in the pan to coat them and heat them up. To serve, arrange vegetables on a plate, and add rice and mushrooms. Sprinkle the rice with sesame seeds if you'd like, then place chicken on top of the vegetables (I used a bed of shredded cabbage and bok choy). I realized last night that comments were restricted to those who had certain accounts such as Google and others, and that no one else could comment. I also found out that Blogger was requiring you to type in some funky words to post. I went in and fixed all that, so now anyone, account or not, can post comments free of hassle. Feel free to post comments or ask questions. I'll do my best to get back and respond to you! Last night I didn't have any meat thawed, but my last baby squid would thaw easily enough, so I made these hand rolls (temaki). I have a recipe for squid temaki, but I was missing an ingredient and I didn't want to deep fry, so I modified it and added some extra vegetables to make it more substantial and hopefully healthier. This is a photo of what I actually made last night. First rinse the rice in cold water several times until the water runs fairly clear, and put in a pot with a tight-fitting lid along with the measured water. Heat until boiling, and continue to boil until all liquid is absorbed, but not too dry, and remove from heat. Leave to sit about 10 min. with the lid left on. After removing the little "flippers," cut the squid body into rings, and then cut the rings so they open into strips. Cut the "ball" of tentacles in half. Mix the flour, salt, and pepper together, and toss the squid in the mixture until coated. Heat the oil in a frying pan--it should just about cover the bottom of the pan. When the oil is hot, add the squid and cook until the coating is golden and crisp. Drain on paper towels. After the 10 min. sitting, remove the lid from the rice and add the rice vinegar. Use a spatula to carefully fold the vinegar into the rice, but try not to stir or the rice will turn to mush. Dump the rice out onto a plate and spread it out so it can cool. Shred the piece of diakon into thin strips, and tear the whole nori sheets in half. Put one of the half sheets down on a work surface, and add a heaping Tbsp. of rice on the left of the nori. 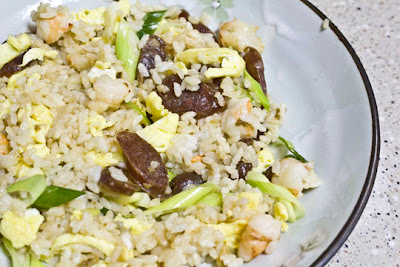 Sprinkle the rice with sesame seeds, then put on a few strips of diakon and 2-3 strips of squid. To roll up, fold the bottom left-hand corner over the rice and filling so the folded edge makes a right angle with the bottom edge. Continue rolling to make a cone. Dab a drop of water on the end so that it will better stick to complete the cone. Repeat to make 3 cones. To serve, cover a plate with shredded cabbage, snow peas, and any left over diakon and squid pieces. Arrange the temaki on top of the vegetables and serve. OK, so probably at least some of you out there have seen soba noodles in the grocery store (Japanese buckwheat noodles). 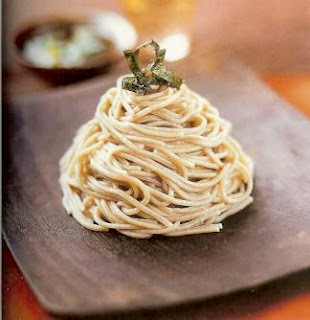 I absolutely love them, and was for the longest time just using them like any other noodle, but recently discovered in one of my newer cookbooks, Japanese Food and Cooking by Emi Kazuko, that soba are traditionally eaten cold with a dipping sauce. So I tried it. Can we say absolutely delicious? Give it a try yourself! Cook the soba noodles according to package directions. Drain the noodles and rinse them under cold water (hence cold soba noodles!). For the dipping sauce, put all sauce ingredients in a pan, bring to a boil, and cook for two minutes. You can strain off the bonito flakes if you want, but I like to eat them with the sauce, myself. Let the sauce cool, then sprinkle in the spring onion and add the wasabi if using. 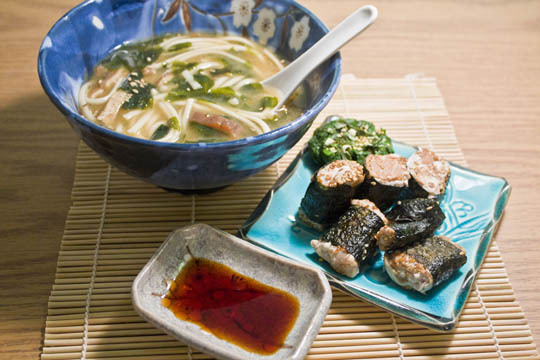 Put the drained soba on a plate or in a bowl, sprinkle with the shredded nori, and serve separately with the dipping sauce. To eat, pick up several noodles at a time, dip them in the sauce, and slurp up the noodles.